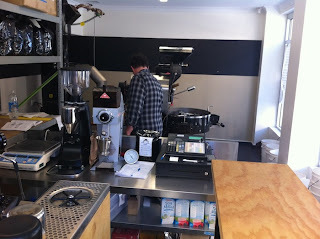 My favourite Perth coffee place just keeps on growing! I finally found the time to head up to Ristretto's new roasting shop in Northbridge (at the corner of William Street and Aberdeen Street, east of the traffic lights), and found it ensconced in a Melbournesque hole-in-the-wall-facing-a-laneway setup. Emmanuel was in the process of roasting some fresh beans, and the air was thick with the most delightful aroma of toasty caramel. I got myself a bag of the RCB (Ristretto Custom Blend), a marriage of the Ethiopian Yirga Cheffe and the El Salvadorian Santa Ana, roasted 10 days ago. When I put it through Miss Silvia, it was all rich, thick, oily goodness in a slow drip; all crema and sweet, nutty flavours. Check it out - if you need a fresh bag of your favourite Ristretto roast, it's certainly easier to drive into Northbridge during the day than it is to try to find a parking spot in the city to get your supplies from Ristretto's Howard Street outpost with no name, or the original coffee bar in the Paragon Arcade.